The Sustainability Lens game works with the business model canvas to create fun, successful and meaningful enterprises. Dona Miguelita and her hand planted mountain quinoa at the edge of Bolivia’s Uyuni salt flats.Support thsi movie on GoFundMe now.A breathtaking documentary that takes us through quinoa fields to farmers’ homes as we learn of the legends and beliefs surrounding quinoa – the Mother Grain. A gift from the Gods to protect and serve all humanity, even after foretold devastating changes. 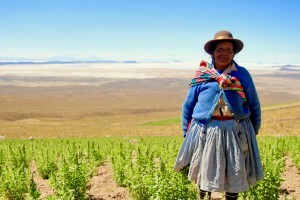 Bolivians feel it is their destiny to make quinoa available to the world. But at what cost? Support this movie on GoFundMe now. As the world opens up and enjoys quinoa, this expansion is bringing down world market prices with more countries producing their own quinoa, flooding the market. And leaving Bolivia’s original quinoa farmers worse off. The farmers cannot compete with industrialized production and are ravaged by climate change, drought, poverty, and the desertification of their lands. They can no longer cover the higher costs of their careful hand production and sustainable, slow farming methods. This documentary will explore the hardships and magic of the twice-blessed magic of twice-blessed, certified, organic Royal Bolivia quinoa and the amazing women who grow it. Come join us in the journey of tragedy, hope, and inspiration.